It's been several months since Colleen, our friend Checkered Flag, and I spent an afternoon at the range. 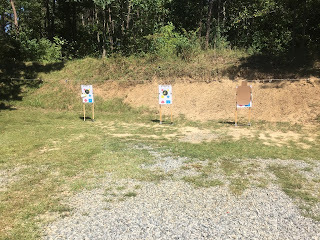 It's always fun to shoot as a group, but I was really anxious to get out as I've missed my last couple of planned practices; last week I took a new shooter to the range and helped him instead of getting my gun out, and this Wednesday all the ranges were in use and unavailable when I showed up. Coincidently as I was heading home from not shooting, CF sent a text message that he picked up a new gun so we planned a trip to the range for the next day. This time a range was available. There was a slight breeze blowing, and combined with the mid-eighties temperature, made for a pleasant couple of hours. We set up the "colored dot" targets and played our Calling Colors game for a bit. I eventually hung an IDPA target for myself, while the rest of the group switched to splatter targets. We shot at various distances from 3 to 15 yards while CF got used to his new gun, and I used that time to practice head shots, SHO and WHO shooting, as well as some draws from the holster. My focus was on my grip pressure and carefully watching the sight alignment through the whole trigger press. I've gotten a little sloppy in those areas recently. I was extremely pleased with my hits throughout the afternoon, but still reminded myself — it's all so much easier when it's not a match day. Of course, we had lot of brass to pick up when we were done. It always seems a lot hotter when you're leaning over finding brass in the gravel. When we got back to the house Colleen grilled up a bunch of panini for a late lunch which we devoured quickly, suddenly realizing just how hungry we were. After satisfying my hunger I had to put in a few more hours of work, and that's when I realized that the afternoon had really worn me out. I was ready for a nap before our evening commitment, but alas there was little time. (Okay, maybe I closed my eyes on the couch for few minutes.) A cup of coffee would have to suffice. But a few extra yawns in the evening is a small price to pay for a fun time outdoors on the range.